Eight tracks with songs in Irish and originals from Max Cohen and Richard Berman. Max’s update of the classic The Parting Glass is joined by Archie Fisher’s Witch of the Westmerlands and John Gorka’s setting of the World War II poem, Letter to St. Peter. This is an all-vocal companion CD to Donna and Max’s 2012 instrumental release, Orange on Blue. 1. Katie Cruel – Max’s hypnotic guitar groove gives this old song a new identity. The song Katie Cruel is an American folk song dating back to Revolutionary times, most likely to Scotland. It‘s linked to the song, Licht Bob’s Lassie (who is, indeed, what you think she is). I learned it first from Peggy Seeger and taught it to Molly on long car trips. 2. Caidé sin don té sin – Molly learned this in Irish Folk Group at NYU, where she earned a minor in Irish Studies and studied Irish language with Donegal native-speaker Pádraig Ó Cearúill. She spent a summer at Trinity College in Dublin and in the Gaeltacht. Pádraig teaches his students to speak by teaching them songs – what could be better? This song is the Irish-language equivalent of “Mind Your Own Business”. 3. The Wedding Dance © Max Cohen & Richard Berman – The melody for this one comes from Max, who sings this lovely waltz. His friend (and consummate lyricist) Richard Berman set words to a beautiful piece Max wrote called “Martha’s Vineyard.” This joint effort won them kudos as Kerrville songwriting finalists. If there’s a perfect father-daughter wedding dance, this is it! 4. The Gifts © Richard Berman – A tale of the road not taken . . . Max taught Molly this song of love and regret while she was in her teens. From Pioneer Valley songwriter Richard Berman, it’s become one of our most popular songs, giving Max the line This Distant Shore for the CD title. 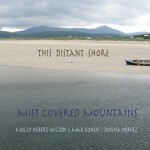 Molly took both ‘distant shore’ cover photos in Donegal. In 2013, she sang it for an Old Songs Festival Celtic song workshop. Archie Fisher, on stage with us, loved it and recorded it for his 2016 CD, A Silent Song. Seems a fair swap for all of his songs we love to sing! 6. The Witch of the Westmerlands © Archie Fisher – This ballad delves into the English Lake District’s legends of shapeshifting water witches, half woman, half horse. Archie’s a master storyteller: “Wet rose she from the lake, and fast and fleet went she, one half the form of a maiden fair with a jet black mare’s body.” Molly learned all 19 verses on road trips as a child, in the days before iPods . . .
7. The Parting Glass (new verse © Max Cohen, Cosmic Squirl Music, BMI) – The classic Irish wake song has been updated by Max, who deepens the song’s meaning with a new last verse. The only a-cappella song on the CD, this one features Max’s heartbreak baritone and we get to back him up. 8. Let Them In, Peter © Elma Dean & John Gorka – Molly sings this lullaby for the fallen soldiers and Max’s guitar does it justice. The poem, Letter to St. Peter, was written in World War II by Elma Dean. John Gorka set it to music in the 80s. The full story is available at johngorka.com/forum/. I served in the military in the ’60s and this brings me back. I, too, wish them to wake whole again. P.S. There’s a surprise hidden track at the end . . . won’t give it away but it will make you laugh! Music samples ©, ℗ 2013 Donna Hébert, Molly Hebert-Wilson, Max Cohen. All rights reserved.